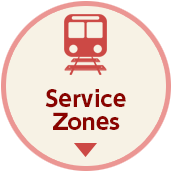 For information about the operating schedules on each line, please check the “Train Status Information” section on the JR East web site or turn to the JR East Infoline. Enjoy travel to Nagano and Niigata with just this one pass! Also available for sale online and from travel agents! Also valid for the Shinkansen, Narita Express and Tokyo Monorail. Passes can purchased at Narita and Haneda Airports and other convinient locations. 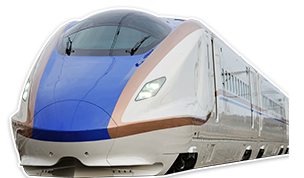 The JR EAST PASS (Nagano, Niigata area) is a special discounted pass available only to customers visiting Japan (with a short-term visa no longer than 90 days) and holding a non-Japanese passport. Show your JR EAST PASS (Nagano, Niigata area) at GALA Yuzawa Snow Resort for three special offers! 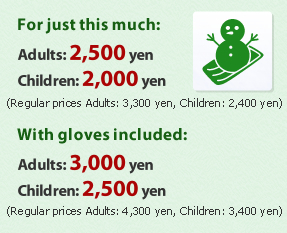 After skiing and playing in the snow, use this package to enjoy a bath in hot spring water. Also includes entry to the swimming pool, outdoor jacuzzi, kids pool and other fun facilities for adults and kids. This timetable shows trains running between Tokyo Station and GALA Yuzawa Station. The official GALA Yuzawa Snow Resort website is updated with the current operating conditions every day at approximately 6:30 a.m. .
We recommend checking the website to ensure there are no closures due to weather conditions or other extenuating circumstances. Use a Tateyama Kurobe Option Ticket (one-way) and take a trip to the Tateyama Kurobe Alpine Route! A great limited time offer!Take a trip to the Tateyama Kurobe Alpine Route on the Hokuriku Shinkansen! Special offer limited to pass users! Get discounts when renting a car at the station with JR Rent-A-Car! Take a trip from Matsumoto to Hida Takayama! The age limitations for Children is determined by the day of purchase. We may ask for the child's passport or other proof of age. Children under age 6 do not require a rail pass unless you wish to make seat reservation for them. No youth rate (over age 11) or Green Car options are available with this offer. Flexible five-day pass: you can use the pass on any five days within a 14-day period starting with the date of purchase or exchange in Japan. 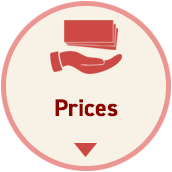 You do not have to determine your 5 travel dates at the time of purchase or exchange. For example, if you purchase your pass or get it by exchange on August 1, you can show the pass at a station on any five days between August 1 and August 14 and it will be stamped as valid for use on that day. Also use JR buses (excluding highway and some route buses) within the area. 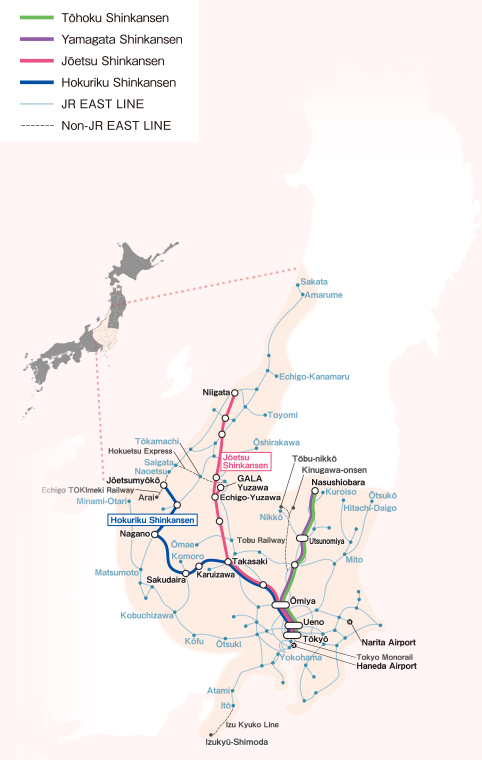 *The JR EAST PASS (Nagano, Niigata area) may be used for Tobu Railway Lines as long as either the departing or destination station is on a JR line. The JR EAST PASS (Nagano, Niigata area) is not valid for the Tokaido Shinkansen as that is operated by a different rail company. The JR EAST PASS (Nagano, Niigata area) is available for purchase by holders of non-Japanese passports with a visa to stay in Japan for no longer than 90 days. The passport is required for confirmation purposes at the time of purchase. Use this opportunity to use a Tateyama Kurobe Option Ticket (one-way) to visit the fall colors of the Tateyama Kurobe Alpine Route! The JR EAST PASS (Nagano, Niigata area) is valid on ordinary cars. To ride on Green Cars, GranClass, individual compartments, Liners or sleeper cars, an additional purchase is required, such as a limited express or sleeper ticket. See the station staff for further details. 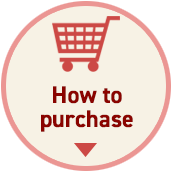 Exchange Orders (e-ticket) can be purchased in advance online or from overseas travel agents. This pass may not be exchanged for a different type of pass after purchase. Before leaving for Japan, purchase an Exchange Order (e-ticket) at a travel agent or another location. Note: Different passes are valid for different areas. 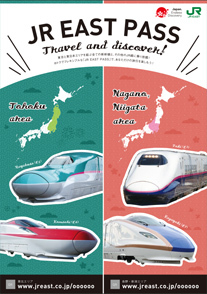 Please verify your desired destinations and the valid area (Tohoku or Nagano/Niigata) before purchase. 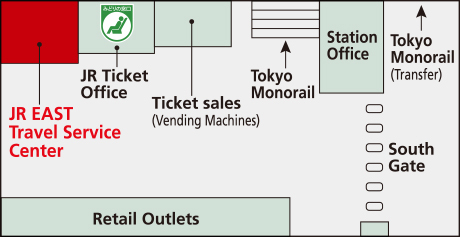 After you arrive in Japan, take your Exchange Order (e-ticket) to an exchange location. Your passport is required. 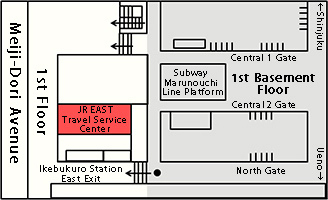 You will receive your JR EAST PASS (Nagano, Niigata area) after confirmation of eligibility. Note: Your actual personal passport is required for the pass exchange. Passport copies cannot be accepted. Select any five days within 14 days of issuance, including that day, when you want to use the JR EAST PASS (Nagano, Niigata area). You do not have to designate your five days of use when purchasing. Note: No person may hold more than one JR EAST PASS(Nagano,Niigata area) of the same type at one time. From the date of issuance of this pass for 14 days, new pass exchanges and purchases in Japan are not permitted. For example, if you do a pass exchange or purchase a pass in Japan on August 1, you cannot do another pass exchange or purchase a new pass in Japan during the validity period of August 1 to 14. 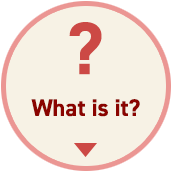 When selling an Exchange Order (e-ticket) with GDS (global distribution system), enter "9B" as the carrier code, "XZJ" for the departure, and "XZP" for the arrival. Purchase an Exchange Order (e-ticket) on the JR East Website. The Exchange Order (e-ticket) will be e-mailed to you. Print it out and bring it with you to Japan. After arriving in Japan, take your Exchange Order (e-ticket) and your passport to a designated location. You will receive your JR EAST PASS (Nagano, Niigata area) after confirmation of eligibility. Your Exchange Order (e-ticket) will be an e-ticket. Print out a copy that shows the details of the e-ticket (name, reservation number, airline ticket number) and take it with you. The Exchange Order (e-ticket) must be redeemed for a JR EAST PASS (Nagano, Niigata area) within three months of Exchange Order (e-ticket) issuance. After arriving in Japan, you can use the pass on any five days within a 14-day period starting with the date of purchase or exchange in Japan. You do not have to determine your five travel dates at the time of purchase or exchange. For example, if you purchase your pass or get it by exchange on August 1, you can show the pass at a station on any five days between August 1 and August 14 and it will be stamped as valid for use on that day. Show your passport at a location where the JR EAST PASS (Nagano, Niigata area) is sold. You will receive a pass after confirmation of eligibility. 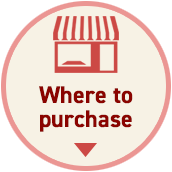 When purchasing, it is necessary to present your passport. Passport copies cannot be accepted. While visiting in Japan, each visitor may have one JR EAST PASS (Nagano, Niigata area) at a time. If you have already purchased a pass, you must wait until the validity period (14 days) of that pass ends before you can purchase another pass of the same type. For example, if you purchased a pass or did a pass exchange on August 1, you cannot do another pass exchange or purchase a pass in Japan during the validity period of August 1 to 14. The JR EAST PASS (Nagano, Niigata area) is available exclusively for visitors from abroad who enter Japan under the entry status of "Temporary Visitor". Both of the below two conditions must be met for purchase and use. The status of temporary visitor is established in Japanese immigration law and permits stays in the country of up to 90 days for purposes such as sightseeing. 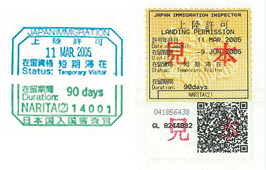 Visitors desiring to enter Japan for sightseeing will receive a stamp, as shown at right, saying "Temporary Visitor" in their passport by the immigration officer. The passport immigration stamp must be presented for confirmation when exchanging for or purchasing a JR EAST PASS (Nagano, Niigata area) in Japan. If the above conditions cannot be confirmed as being met, travelers may not be allowed to purchase a pass or redeem an Exchange Order (e-ticket) for a pass. Also, please carry your passport when using your pass. It may be required by JR staff for identity confirmation. Visitors with dual citizenship in Japan and another country will not be able to use a JR EAST PASS (Nagano, Niigata area) if they entered Japan with their Japanese passport. A JR EAST PASS (Nagano, Niigata area) cannot be purchased if the period of stay in Japan noted in the passport is shorter than the validity period of the pass. 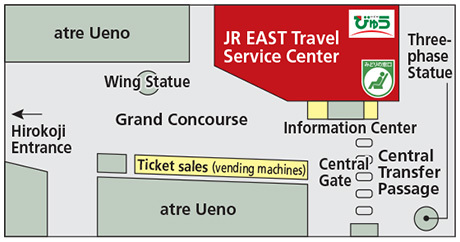 The JR East Pass (Nagano, Niigata area) is accepted at any JR East Travel Service Center, or at any of the JR East ticket windows listed below. Note: Ticket locations are subject to change. Some JR East Shinkansen and limited express seats can be reserved online. Seating is limited, so please make your reservation early. If no reserved seats are available, please use the unreserved seating. JR East does not make refunds for the difference between the price of a reserved and an unreserved seat in such situations. The starting date of the JR EAST PASS (Nagano, Niigata area) may not be changed. 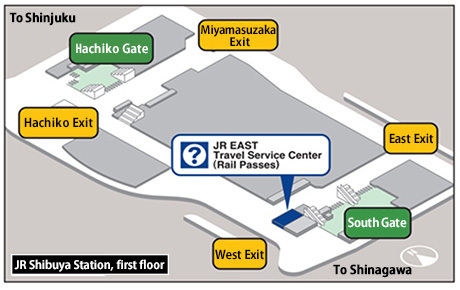 Refunds are available at JR EAST PASS (Nagano, Niigata area) sales and exchange locations. The pass must be unused and the validity period cannot have started on the day the refund is made. If the JR EAST PASS (Nagano, Niigata area) has clearly not been used, a refund may be made after the start of the validity period. In this case, a refund fee applies. However, if a reserved seat ticket was issued with the JR EAST PASS (Nagano, Niigata area), no refund will be made after the departure time regardless of whether the pass has been used to ride a train. The application/backing must be still attached to the JR EAST PASS (Nagano, Niigata area) to receive a refund. Refunds are not made for canceled or delayed train service (exceptions may be made for total system stoppages). Refunds are made for Exchange Orders (e-ticket) within one year of issuance if not redeemed. See the seller for the refund. A fee may be charged by the seller. JR East does not make refunds for Exchange Orders (e-ticket). Lost Exchange Orders (e-ticket) and JR EAST PASS (Nagano, Niigata area) will not be reissued. 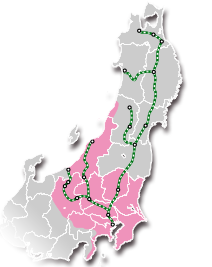 The JR EAST PASS (Nagano, Niigata area) is non-transferrable. Only the person whose name is on the pass may use it. Travelers must carry their passport when using the JR EAST PASS (Nagano, Niigata area) as they may be asked to present it for identification purposes.